Abstract: Flush mount LED ceiling lights offer robust application suitability, versatile design flexibility, and significant energy savings for both light retrofits and new installations. 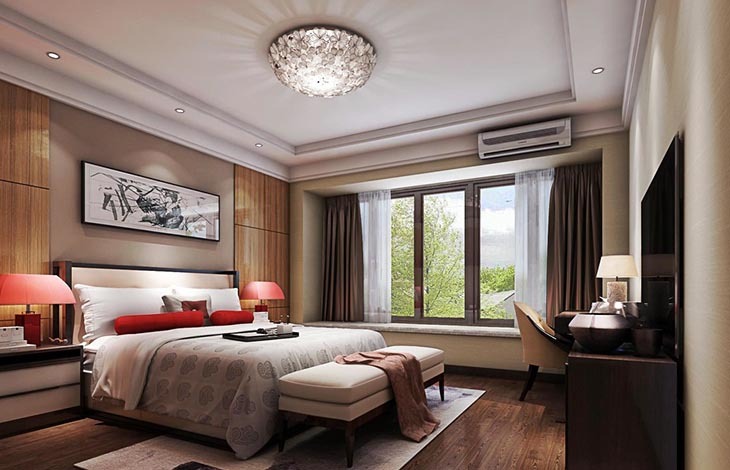 Ceiling lights are the most prevalent ambient lighting fixtures in residential settings to provide all or most of the lighting for accommodating various tasks and activities. Architects and interior designers consider ceiling light fixtures to be a critical element of the functional performance and aesthetic characteristics of interior spaces they design. 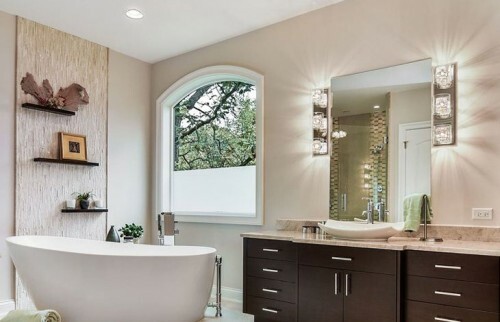 Flush mount ceiling lights are often an important ingredient in achieving quality lighting and lending visual appeal for living rooms, bathrooms, bedrooms, kitchens, hallways, closets, hallways, foyers, patios, garages, and other indoor spaces. Flush mount ceiling lights are designed to be mounted flush with the ceiling, which means no gaps are left between the ceiling plane and the light fixture. 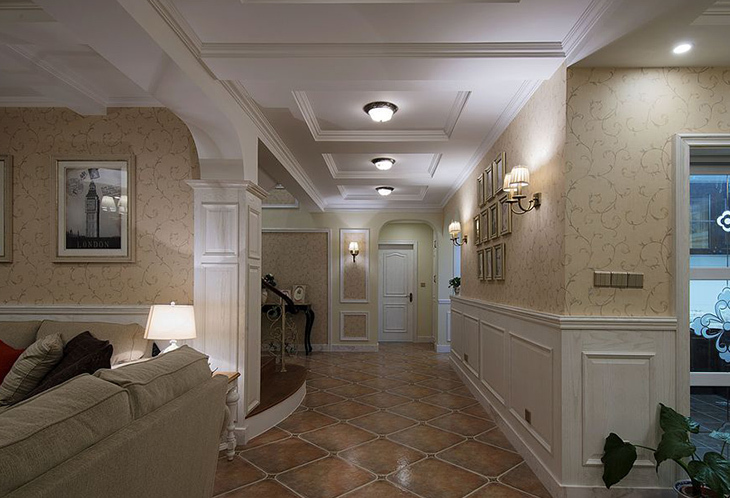 Flush mount fixtures unobtrusively hug the ceilings to provide a source of ambient lighting and meanwhile set the tone for distinguishing style. These low-profile lights are the central respiratory lighting sources for rooms where space is at a premium and the ceiling height is limited. When it comes to low-ceiling lighting, many people believe that downlights are the sole viable option. Nevertheless lighting designers often include flush mount lights when listing their preferences because of the incredible versatilities offered by these fixtures. A semi-flush mount light is mounted close to ceilings with a base that sits flush against the ceiling. The fixture typically includes a rod or several stems dropping down from the base to hold the light assembly which usually hangs 8" to 21" below the ceiling surface. A semi-flush mount fixture can evoke the same exquisite aesthetics with pendants and chandeliers but in a more compact form. These fixtures are especially critical for low-ceiling spaces that do not meet the steep vertical space installation requirements of pendants, chandeliers or other dangling lights. Flush mount and semi-flush mount ceiling lights range from the basic single flush fixtures in round or square shapes to elaborate structures with multiple arms (sometimes on multiple levels). A single flush fixture typically has a shallow profile which encloses its light sources by a round or square housing which generally serves as a diffuser to soften and distribute the lights projecting downward from the light sources. Such a design may also come with a diffuser frame which conceals the sides of the light fixture and hold the diffuser at the bottom of the fixture. The light sources may be detachable light bulbs or integrated light engines. Semi-flush mount fixtures are generally more decorative and built in a variety of configurations which include single fixtures with more stylish frames and shades, and discrete fixtures with multiple stems artistically designed to accommodate light bulbs, such as medium base (E26, E27), candelabra (e12), G4, G9, G10, GU24, GX5.3, bi pin bulbs, etc. The frames are constructed from aluminum, stainless steel, iron, metals, wood, plastics, and synthetic materials. They're painted or powder coated in finishes or tones such as nickel, bronze, chrome, white, copper, brass, gold, silver, black, brown, blue, green, grey, glass, pewter, rust, etc. In addition to energy efficiency, optical performance and product quality, consumer's choice of lighting fixtures largely depends on the product design. Light fixtures which are mounted on a ceiling of a private space can be an outlet of personal expression that sets a mood and creates the desired atmosphere. Ambient light fixtures are an important consideration in complementing the architecture style of an interior space. Modern and contemporary style lighting fixtures make a statement of essential vitality and create a spacious feel conducive to relaxation. Traditional and vintage light fixtures configured with more ornamentation and complexity offer a retro-inspired look with classic, timeless elegance. Transitional ceiling light fixtures are versatile, blending the subtle touches of traditional elements with the on-trend facets of contemporary style. The rustic character of a flush mount fixture generates a practical rural decor with a cozy and pleasant feel. The art deco-style lamps cast a glamorous sparkle with the ultimate retro luxury and streamlined visual appeal. Mission and craftsman style lighting fixtures are characterized by straightforward simplicity and classic silhouettes delivered by geometric patterns, and rich, warm materials. A host of other styles, such as art nouveau, nautical, eclectic, industrial, tuscan, colonial, tropical, kids, Victorian, Euro Luxe, Scandinavian, Asian, Mediterranean, etc., are available to accommodate various themes. Flush mount and semi-flush mount ceiling lights are designed in wide range of shapes with bowl, dome and drum being the most common designs. The lamp shades are also available in cylinder, disk, globe, bell, oval, cone, acorn, lantern, flower, urn, teardrop, and tapered designs. The shade or diffuser is often made of acrylic, glass, crystal, fabric, or other niche theme-matching materials such as ceramic, stone, shell, etc. The shades are processed by lighting manufacturers to complement to the home decor. Frosted lamp shades create lovely diffused ambiance in any environment. Etched lamp shades allow for a very fine detailed embellishment. Tiffany or stained glass shapes offer an extraordinary reproduction of classic elegance. 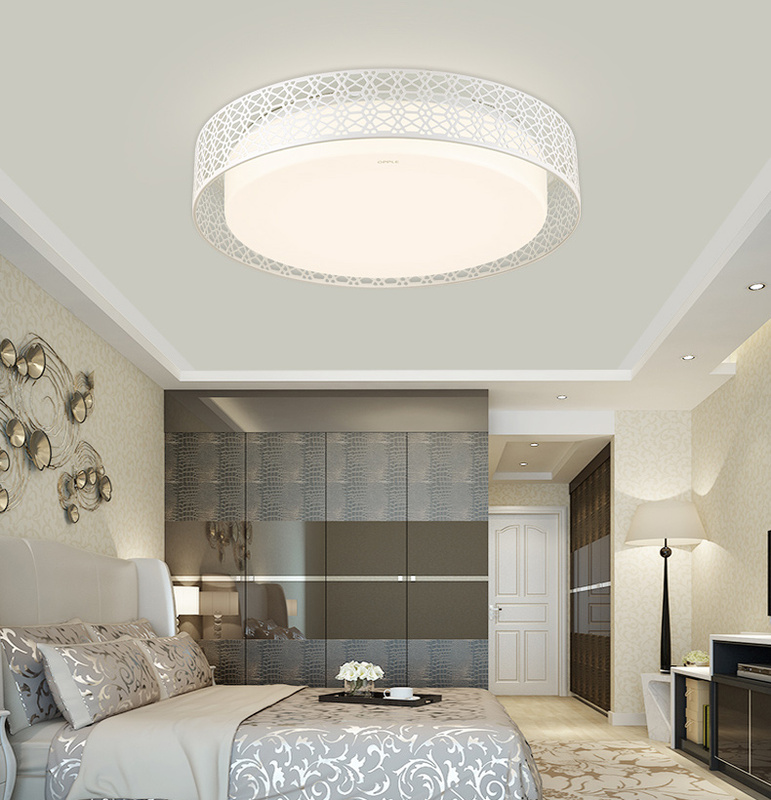 Ceiling lamp shades are also beveled, pleated, or laser cut to meet designer's demanding needs. Historically, compact fluorescent, incandescent and halogen bulbs have been employed ubiquitously for the past several decades as the light sources for flush mount ceiling light fixtures. Incandescent and halogen lights are very energy-inefficient light sources. Notwithstanding the advantages of energy efficiency over incandescent light bulbs, compact fluorescent lamps have a number of limitations. 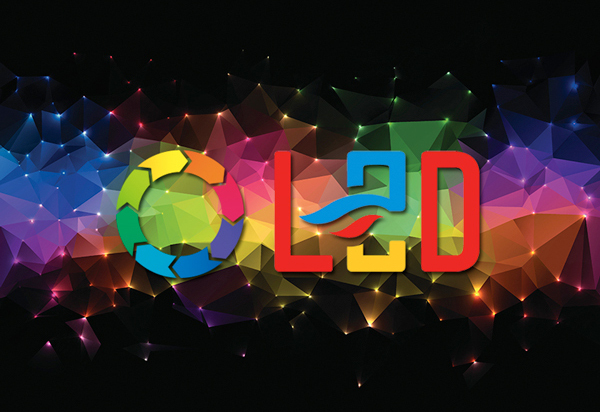 The most recent evolution in light emitting diode (LED) technology presents a viable solution for interior lighting which requires high quality spectral output with excellent color rendering ability as well as high energy efficiency over an extended lifecycle. LED lighting offers technical feasibility, design flexibility, and economic merits for both light retrofits and new installations. One challenge in retrofitting existing ceiling lighting fixtures is that there are many different light bulb models, an assortment of light distribution patterns and widely varying structural specifications. 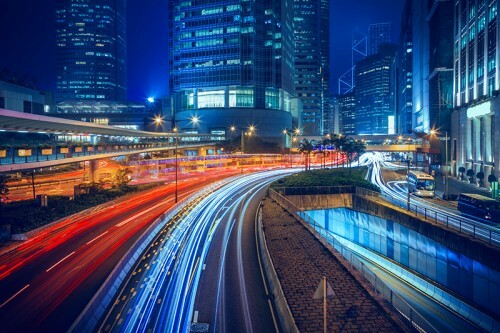 The technological maturity of solid state lighting has already induced a large-scale commercialization and application popularization of LED retrofit lights. Nearly every conventional ceiling light source has its LED replacement. For instance, compact fluorescent plug-in light bulbs had been one of the primary light sources for flush mount and semi-flush mount ceiling fixtures. Today it is commonplace to find LED replacement bulbs that mimic the form factors of PL-L, PL-C, PL-T, PL-S, PL-R, and PL-Q (2D) lamps with various forms of 2-pin or 4-pin bases, such as G-23, GX23, GX23-2, G24d-1, G24d-2, G24d-3, GX32d-2, G24q-2, G24q-3, GX24q-2, GX24q-3, GX24q-4, 2G8-1, 2G11, GX24q-5, and GX32d-3. These LED retrofit bulbs offer a hassle-free installation, and more importantly, exhibit a higher luminous efficacy than incandescent and CFL bulbs. Single flush LED ceiling fixtures typically use integrated lighting modules or DOB (driver on board) LED light engines to optimize the light distribution, achieve a low-profile structure, and help reduce the circuit cost. Generally, a plurality of SMD LEDs are attached to a MCPCB (metal core printed circuit board) along with other electrical components which may include power supply, driver components, dimming circuit, power factor corrector (PFC) circuit, occupancy sensors, surge and thermal protection modules. The PCB serves as a heat sink to transfer the heat flux generated in LED junctions into the ambient environment. Lighting designers are frequently obsessed by the trade-offs between incandescent and fluorescent technologies that may be found in their atmospheric statement, energy efficiency and dimmability, which are characterized by the physics of their respective illumination mechanisms. From the aesthetic aspect lighting designers prefer the warm white output and the classic look of an Edison style filament bulb. 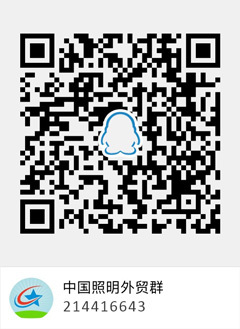 Whereas fluorescent technology is inevitably advantageous in terms of energy efficiency and operational life. However, incandescents offers a better dimmability than fluorescent lamps which are considered a non-linear system that is difficult to generate controllable electrical stimulation and produce a corresponding adjustable light output level. 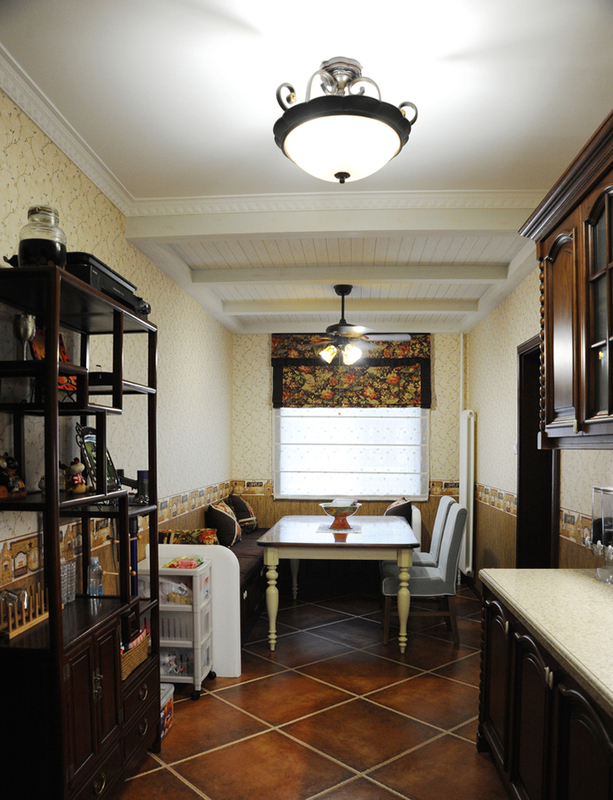 LED ceiling lights overcome the aforementioned disadvantages associated with incandescent and fluorescent technologies. The excellent controllability makes LED the unrivaled technology for scenario lighting. The significant energy savings and lifespan facilitate the efforts of sustainable lighting which represents the next natural progression into our evolving lighting standards and practice. LED light bulbs not only can be made to illuminate with a tailored white luminous impression, for example the correlated color temperature (CCT) range of 2700 K-3300 K to for a warm and inviting atmosphere. They can also be designed with a highly resembling form factor of traditional products. LED filament bulbs, offering aesthetically pleasing light with the identical appearance to a standard incandescent bulb, are a perfect blend of the retro aesthetics and cutting-edge technology. They have been increasingly capturing the attention of architects and interior designers as the light sources for ceiling light fixtures. 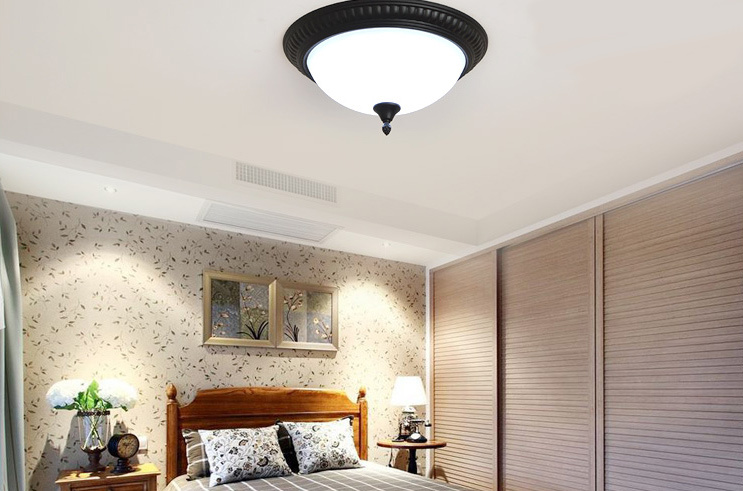 The biggest concern associated with flush mount LED ceiling fixtures is the light quality, which is especially critical for residential lighting. By the very nature of the illumination mechanism of solid state emitters, LEDs have a directional light output. While direct lighting systems like flush mount luminaires provide a high light output efficiency in delivering light to a horizontal task plane, an uninterrupted illumination travels directly from the overhead light source. Direct glare occurs when the luminance ratio in relation to the state of adaption is excessively high due to the directionality of LED lighting. The glare may result in discomfort and disability. Unlike edge-lit LED panel lights that utilize an internal reflection mechanism to produce a homogenous light output and thereby reduce glare, flush mount ceiling lights are generally direct-lit luminaires. Accordingly diffusing optics are of critical importance to scatter and soften the light. The second problem would be the flicker phenomenon caused by the temporal variation or ripple in the power supply to the light source. The flicker problem can be solved by employing energy storage devices in the driving circuit to bridge the fluctuation in the instantaneous input power. However, some lighting manufacturers eliminate the use of costly rectifiers and capacitors, which are originally arranged across the diode bridge to effectuate the load delivery. Flicker elimination becomes more challenging for the space-constrained single flush LED ceiling fixtures wherein the bulky electrolytic capacitors which provide the necessary large capacitance for storing electrical energy and reducing flicker are not used. Flush mount LED ceiling fixtures are packed with a variety of features owing to the robust application suitability of LED lighting to various interior spaces. Various types of lighting control modules can be selectively incorporated to support visual needs (luminance adjustment, mood setting, preset scene controls) as well as energy management needs to reduce electricity consumption while meeting light quality requirements. Ceiling lights with automatic lighting controls can switch or dim designated loads in response to occupancy sensing, movement detection, daylight fluctuation or other control schematics and programming instructions. The development of wireless control technology and internet-based networking protocols will make LED ceiling fixtures one of the most popular smart lighting systems in the Internet of Things (IoT) architectures.